First off.... Yes, I know. The background concept is just like the ORIGINAL ones. That's because, no matter how hard I tried to made different concept, I always find myself making the same ones. *sigh* So, I gave up and made this! Well, at least I made everything else myself.... I love everything on this wall, well... maybe for the stars and the building (& the reflection!).... I'm no good making the reflection.. and the tutorial I had is.... lost. This is the best I could do... Err... Enjoy! WOW! Me Likey! Adding to *Favs* Full Moon wouldn't be Full Moon without the same concept. I love this wall, it is so beautiful! Thank you so much for sharing! I have to go and look at your other walls now! yay!!!! full moon with a very nice scan of a very pretty fairy! Me love it and yeah keep it up!!! Amazing one! Nice moon behind this girl and this wings ... Great work here! cutee!! 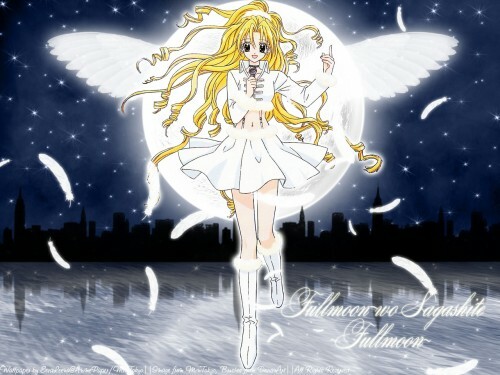 I love angels in a celestial background like this!! you did a great job and added nice effects too!! I see some mistakes but the wallie is really good! Wow! this is pretty! I used to be very obsessed in this series. Guess that it had worn off after some time. Nice job on ur wallpaper as usual. Cya! Um, wow. Shiny. *_* Very pretty and soothing looking. (couldn't think of a better word to use for how much I like night styles besides "soothing" >_>) Also, the text is very elegant looking. Nice job. oh wow. Absolutely beautiful scene. Really. The beauty of the white angel really contrasts well with the night background. dang!! i really wanna download this wallpaper~~ T-T level too low!! !